After some technical difficulties, we’re back and with Genesis’s new G-Guard in tow! AUTO: When this unit is placed on G, choose 1 of your rear-guards, and if you have a card in your soul with the same name as that unit, this unit gets Shield +10000 for that battle. Today’s card is “Battle Maiden of the Dome, Hanasatsuki” from “Absolute Judgment” (on sale August 26th, 2016)! A G Guardian for 《Genesis》 has appeared! 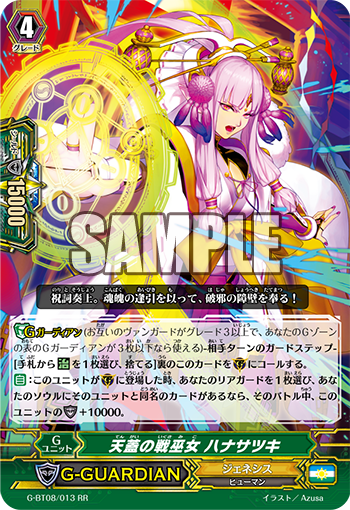 “Battle Maiden of the Doom, Hanasatsuki” lets you choose one of your Rearguards, and if there is a card with the same name in your Soul as that Unit, this card gains 10000 Shield. Because there’s no cost to activating this Auto ability, as long as you can meet the conditions for activating, it’s OK! This ability works well with the new 《Genesis》 clan ability, 【Revelation】. 【Revelation】 is a clan ability that when a card appears in the designated circle, you can either return that card to the top of the Deck or Rest that card to Soul In. The turn before you Generation Guard, you can potentially Soul In a card with the same name into the Soul, so you should be good! By using this G Guardian with an iron defense and 【Revelation】 which lets you glimpse into the future, you’ll be able to advance your position!